Monsters abound in medieval culture, from giants to serpentine women and dog-headed saints. Often, monsters threaten communities through evocative ways; the most terrifying or even edifying monsters are those whose physical form is a mystery. Grendel terrorizes Heorot, but exact details of his physical appearance are unclear despite gestures towards his size, ferocity, and monstrosity. Yet monsters also frequently leave traces that suggest the magnitude of their physical presence. Early archaeological sites such as Maen Ceti (the 14 ft rock Arthur purportedly pulled from his shoe and threw away) speak to the gigantism often associated with Arthur’s figure, while the footprint embedded on the window sill and the trembling of the tower upon which Melusine perches emphasize the sheer weight of her winged and tailed body. In other cases, they leave behind more direct relics, such as the “griffon’s claw” associated with St. Cuthbert, or the many “unicorn horns” owned by European royalty as talismans against poison. Monstrous bodies were thought to exist in time and space; their presence is felt in real and palpable ways. No matter their size, these monsters leave their physical imprint upon the material structures of the world around them. However fantastic, however elusive, monsters exist in material and tangible ways—woven into tapestries, painted into frescoes, and melded into glass. This panel seeks to examine the material aspect of monstrous beings in medieval culture, to uncover the impact of their presence in the world that imagines them in various forms. We invite papers from all disciplines and national traditions that examine every aspect and avenue this connection evokes. Topics may include: literary representations that emphasize the material nature of monsters; material depictions of monsters in other media such as sculpture, architecture, tapestry, glassworks, frescoes, and paintings; and physical remains or archaeological artefacts associated with monstrous beings and myths and legends. Please send abstracts of no more than 250 words together with a brief bio to session organizers Asa Mittman (asmittman@csuchico.edu) or Renée Ward (rward@lincoln.ac.uk) by the 31 August 2018. 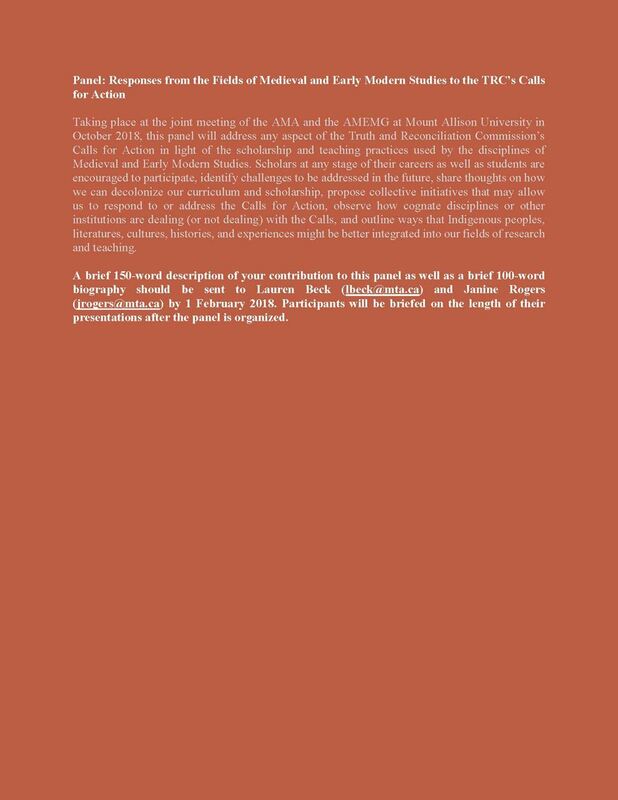 Please include your name, title, and affiliation on the abstract itself. All abstracts will be vetted by the MEARCSTAPA board and the full session will be submitted to the Congress mid-September 2018. Additionally, MEARCSTAPA will provide an award of $500 to the best graduate student/independent/unwaged submission to this or any of its sessions to help offset the costs of travel and lodging for the IMC. As an organization dedicated to the study of marginalized communities and entities in the Middle Ages and beyond, MEARCSTAPA affirms its position on diversity, inclusion, and inquiry within all academic discourses. We support and embrace those who have been marginalized, excluded, and othered in medieval studies. We disavow hatred and intolerance. We walk the borders, but do not police them; we welcome your company. We will arrange a carpool to Athol Murray College for those wishing to visit its collections. Cars will depart from Regina at 8:15 a.m. Please contact David Watt (david.watt@umanitoba.ca) by noon on Sunday, May 27 if you plan to attend and indicate whether you need a ride to Wilcox or can provide a ride to others (please get in touch sooner if you can). The manuscript holdings (a 13th-century Venetian deed) and early printed books at the Archer Library, University of Regina, are available at request. “‘There are Few Things More Powerful than Destiny.’ Gender, Power and Foresight in The Sagas of the Icelanders"
All are welcome (and encouraged) to attend Crave Kitchen + Wine Bar (1925 Victoria Ave). Please speak to Meredith Bacola (Meredith.Bacola@umanitoba.ca). The cost will be $39 plus tax, gratuity & your own beverages. What Do We Study When We Study Manuscripts in Canada? The Spanish Society for Mediaeval English Language and Literature and the local organising committee invite members of the Society and all other scholars interested in the field to participate in the 30th International SELIM Conference (https://selim30oviedo.wordpress.com), which will be hosted by the Department of English, French and German of the University of Oviedo from September 27th to 29th 2018. The organisers welcome papers dealing with any aspect of mediaeval English language and literature and particularly encourage the submission of papers that offer new readings or perspectives on mediaeval English texts, as well as new approaches and analytical techniques. Scholars interested in offering 20-minute papers (followed by a 10-minute discussion) should submit their abstracts in electronic format via e-mail to congresoselim@uniovi.es by April 30th 2018. Abstracts should include name(s), institutional affiliation(s) of the author(s), as well as e-mail address and the technical support required for the presentation. They should preferably be submitted in Microsoft Word, Rich Text Format, or PDF format, and should not exceed 400 words (including references). Acceptance of proposals will be confirmed as soon as the proposals have been peer-reviewed. The network as a subject of study has blossomed in Medieval Studies in recent years. The notion of ‘textual community’ coined by Brian Stock has focused critical scrutiny on the ways in which literature calls communities into being. Renewed attention has been paid to the links between different authors and texts, but also to the social dimension of reception – who owned and read literary texts, what motivated owners and audiences’ interest in them, and how literature contributed to binding different communities together. Meanwhile, conceptual tools such as Bruno Latour’s actor-network model are proving to offer productive and increasingly popular ways of thinking about the connectedness of medieval texts, their creators, and audiences. The International Courtly Literature Society proposes to recognise the vibrancy and timeliness of this topic by making it the central theme for its next International Triennial Congress, which will be held at the University of Exeter (UK) from 22-27th July 2019. We invite proposals of up to 200 words for 20-minute papers in English or French, to be submitted by 15th June 2018. We are also interested to welcome full panel proposals of up to 4 papers. Alongside the main business of scholarly exchange and debate, the conference will include visits to local medieval landmarks and other places of interest. All these activities will take place in a spirit of collaboration, community, and friendship, which will allow participants to build and renew their own professional and personal networks. Le réseau est devenu un sujet de prédilection pour les médiévistes au cours des dernières années. La notion de ‘communauté textuelle’ définie par Brian Stock a eu l’effet de focaliser l’attention des chercheurs sur les divers moyens à travers lesquels la littérature donne naissance aux communautés. La critique s’est évertuée à relever les rapports entre différents auteurs ou textes, mais aussi à détailler la dimension sociale de la transmission : la nature de l’intérêt porté aux textes littéraires par leurs publics, l’identité et les motivations de ceux qui commanditaient ou collectionnaient ces textes, et la capacité de la littérature à créer et à nourrir les communautés. En même temps, divers modèles conceptuels tel que la théorie acteur-réseau développée par Bruno Latour se sont révélés utiles pour analyser les liens entres les textes médiévaux, leurs créateurs, et leurs publics. La Société internationale de littérature courtoise se propose de reconnaître l’importance et l’actualité de ce sujet en l’inscrivant comme thème principal de son prochain Congrès international, du 22 au 27 juillet 2019 à l’université d’Exeter (Royaume-Uni). Nous vous invitons à nous faire part de vos propositions en envoyant un résumé de 200 mots maximum (en anglais ou en français) pour des communications de 20 minutes, avant le 15 juin 2018. Nous lirons aussi avec intérêt les propositions d’ateliers complets (maximum 4 intervenants). Les échanges intellectuels qui constitueront le fond même de la conférence seront agrémentés de plusieurs visites organisées, comprenant d’importants sites médiévaux de la région. Toutes ces activités se dérouleront dans un esprit de collaboration, de communauté, et de convivialité, qui permettra aux conférenciers de développer et de nourrir leurs propres réseaux personnels et professionnels. The Oxford University Summer School for Adults is a stimulating, accredited programme that has existed for over a hundred years. The summer school brings together a cosmopolitan range of like-minded students for a self-contained week of specialised study overseen by some of the finest tutors in the country. This course takes as its starting point the manuscript as artefact existing of and beyond its time. 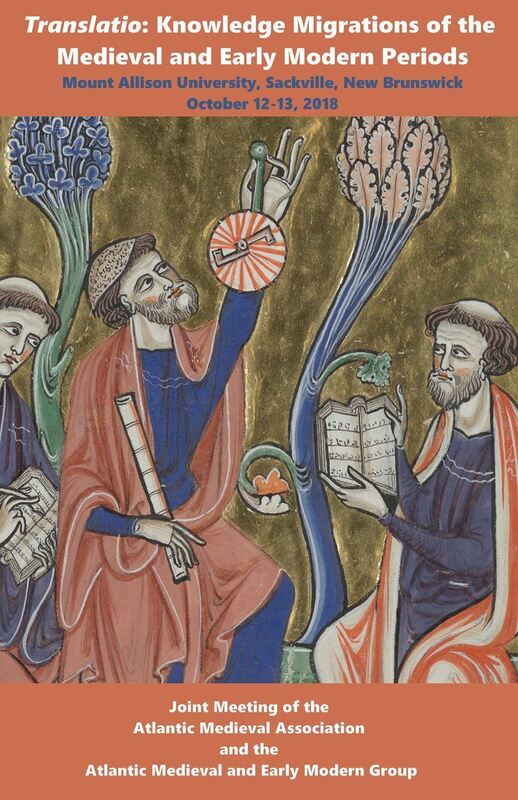 We consider the production of manuscripts to meet an emerging literate class in the 14th and 15th centuries. As part of this exploration we’ll consider a number of specific examples taken from devotional books and secular literary material such as romance. The course will move forward to consider the afterlife of manuscripts in the hands of 19th and 20th century collectors: what motivates a bibliophile to collect centuries-old material and what relevance do collections of manuscripts in public institutions have for us today? The course will be taught by Dr Victoria Condie, who has taught courses in medieval and Old English literature for OUDCE and currently teaches medieval language and literature at the University of Cambridge. The special theme for this year’s Congress is “Gathering diversities/Diversités convergentes,” but papers for the CSM Annual Meeting can address any topic on medieval studies. Proposals for complete sessions are also invited. Presentations may be made in either English or French. Bilingual sessions are particularly welcome. Proposals should include a one-page abstract and a one-page curriculum vitae. Papers should be no more than 20 minutes' reading time. Proposals for complete sessions should include this information in addition to a title and a brief explanation of the session and its format. Keynote speakers this year include Thomas Dubois (in cooperation with the Association for the Advancement of Scandinavian Studies in Canada), who will speak on “Sacrality and the Landscape in the Nordic Middle Ages” and David Watt (past president of the CSM), who will ask “What do we study when we study medieval manuscripts in Canada?" Le thème du Congrès de cette année est: “Gathering diversities/Diversités convergentes.” Les communications à ce congrès annuel de la SCM peuvent toutefois traiter de tout sujet relatif aux études médiévales. L'invitation est également lancée pour des propositions de sessions entières. Les communications peuvent être données en anglais ou en français. Les sessions bilingues sont particulièrement bienvenues. Les propositions devraient inclure un résumé et un curriculum vitae d'une page chacun. La durée de lecture maximale des communications devrait être de 20 minutes. Les orateurs pléniers sont Thomas Dubois, de l’Association pour l’avancement des études scandinaves au Canada, “Sacrality and the Landscape in the Nordic Middle Ages,” et David Watt (Président sortant du SCM), “What do we study when we study medieval manuscripts in Canada?" Please submit proposals by January 31, 2018 by email to David Watt, either by regular email (David.Watt@umanitoba.ca) or via our website’s email system (www.canadianmedievalists.org). You must be a member of the CSM to give a paper. Prière de soumettre de soumettre vos propositions au plus tard le 31 janvier 2018 par courriel à David.Watt@umanitoba.ca ou par le courriel de notre site, www.canadianmedievalists.org. 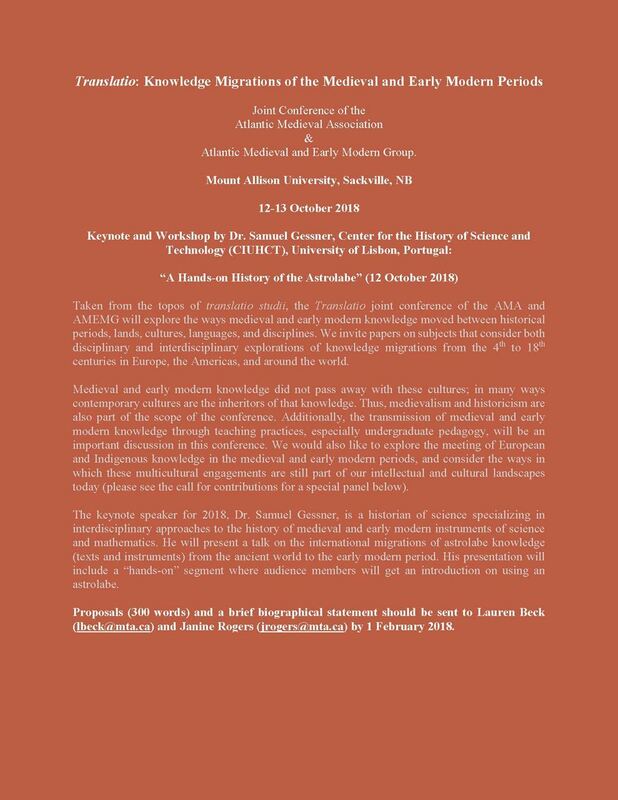 Please consider submitting a paper to the joint conference of the Atlantic Medieval Association and the Atlantic Medieval and Early Modern Group, which will be held on the 12-13 October 2018 at Mount Allison University. See the poster below. The theme is Translatio: Knowledge Migrations of the Medieval and Early Modern Periods, and we welcome papers from all fields: please see the attached poster and CFP. Please note also that the CFP includes call for contributors to a special panel on Responses from the Fields of Medieval and Early Modern Studies to the TRC’s Calls for Action. The keynote speaker will be Dr. Samuel Gessner from the University of Lisbon. He will present a talk on the international migrations of astrolabe knowledge (texts and instruments) and his presentation will include a “hands-on” segment where audience members will get an introduction to using an astrolabe. The deadline for 300 word proposals for 15-20 minute papers is 1 February 2018: please send the proposals by email to Janine Rogers and Lauren Beck: jrogers@mta.ca; lbeck@mta.ca. Please circulate this call for proposals to interested colleagues: we look forward to hearing from you soon.